The Mini Plus is an indoor HD 1080p smart home Wi-Fi camera built for the connected home. Stay connected when you’re not home. Receive motion alerts on your phone to keep track of what's happening. Take photos and record footage any time you want with the EZVIZ app, while easily saving or sharing on social media from your smartphone. (1) Local storage up to 128GB MicroSD card to save video. (2) 7-day and 30-day cloud storage options, with free 30 day trial. (3) Use all of the above for duplicate backups of your video. Adding as many cameras as you want is easy and visible all in one app, for your home or small business. The Mini Plus runs on EZVIZ's adaptable platform, which adds new features and functionality as they become available with easy one-click updates. (2) Have smartphone or tablet on same 2.4GHz or 5.0GHz network as camera. 1080p HD VIDEO and wide-angle 135° view for clearer video and sharper details over a wider area. Improved night vision sensor automatically switches for clearer HD video when it's dark. 19 of 21 people found the following review helpful. Love so far! So, I installed these last night. The installation was a little weird because it is easier on the iPhone, do not try on your ipad! But, now that they are working, my only complaint is the start up when you open the camera and the heat. Much like other reviewers, they do get hot. It hasn't caused me a lot of heartache yet but, I will post an update soon. Also, it's not easy to use the program on a computer. Use your phone ! But, this is a new product so I'm sure it will change. Camera quality is pretty amazing though, even on the lowest setting. 24 of 27 people found the following review helpful. this is perfect! 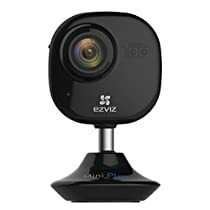 i have tried other cams and they have had a delay, the ezviz has no delay! its is slightly warm but not hot as some reviewers have said. Not too hot at all, i have mine on constantly and no heat issues. the size is perfect, much smaller then the other options. its attractive. before this we tried the nest cam, it was large, heavy, had a delay, you couldn't rotate it, an add to buy their service was constantly overlaying on the video. I replaced the sd card in mine with a larger 128mb one for more storage. the app is just fine and not glitchy as others have said. There is likely room for improvement but nothing that affects ease of use. i would recommend this cam to anyone. it seems to be the best on the market. I have tried Amcrest, Zmodo, Arlo and now EZVIZ. While there are pros and cons to them all, EZVIZ sits at the top of the heap when all is considered. EZVIZ has the best app user interface and by far, the best customer service. Excellent quality product, excellent HD resolution and an app that actually works! Combine your indoor and outdoor camera's in the same app, and best of all, use an SD card to record and don't pay a monthly fee. Did I mention that you can call customer service and talk to a smart person without having to wait for an hour?